The Afghan Modern, its anonymous authors, and the question of collective agency. Here’s a summary of a paper I presented to the Annual Conference of the Art Association of Australia and New Zealand, at Sydney University, last Friday 13th July, 2012. Addressing the inherent tension in the three elements of my title: what is the Afghan Modern? who are its anonymous authors? and how does a concept of collective agency assist our interpretation of what these artists make? I suggested that the unfamiliar or even contradictory relation between concepts of The Modern with that of both anonymity and collectivity can be resolved by the introduction of a concept of collective agency – an idea which was implicit but not developed in Alfred Gell’s definitive Art and Agency of 1998. In this paper I proposed that the concept of collective agency supercedes the problem of the anonymous author for our understanding of these works as a form of indigenous modernism. All these works propose collective social values and behavior as the source of intentionality, creativity, and virtuosity – that is, the capacities that enable the artefact to enchant (in Gell’s theory) through its abducted agency. I also proposed that the consideration of collective agency demonstrates that there is, in this instance, a capacity to reconcile the tensions between modernity and tradition – which has produced a form of indigenous modernism developed independent of the colonizing effects and assumptions of the West (contra John Clark’s account) and in contrast to the continuity and reinvention of local neotraditionalism. And so I sought to demonstrate how a concept of collective agency is also a means by which one can reconcile the apparent contradictions between an unfamiliar form of modernist art and the anonymity of its makers, and through a new understanding of the intrinsic interplay between individualism and collectivity as the means by which this genre has been produced. In this paper I focused on a particular set of images, the modernism of which is reflected in the capacity of the designers to integrate new forms into the medium of the carpet, in order to convey narrative and other meanings derived from contemporary graphic sources. In these images the key emblem – the map of Afghanistan – is transformed in ways which reveals the capacity of an artist to explore form-for-form’s sake – by creating complex and apparently contradictory imagery which is completely new and distinctive to the genre. In my argument about the modernity of artefacts such as these, I’m concerned not so much with the direct translation of graphic conventions into the medium of the knotted carpet but rather I’m looking at the more complex transformation of this emblematic and cartographic icon – here presented as the primary icon of national identity, and unity, in response to the experience of the occupation by the Soviet Union. In the paper I discuss examples of this re-orientation of the form of the map of Afghanistan (rotated 90 degrees counter-clockwise) such that it loses its cartographic accuracy or relevance at the same time as it gains added symbolic significance and spatial complexity through its novel and ambiguous pictographic character. The evolution of these maps towards a landscape form – what in Chinese art would be called a floating perspective – is here also affective by its evocation of national identity, suggesting character, resistance, and isolation – all as positive virtues – despite all of the ethnic complexities, rivalry, and conflict, (implicit in the complexity of the map form itself), manifest in the civil conflict that burst on the scene in the years immediately after these rugs were made. P.S. 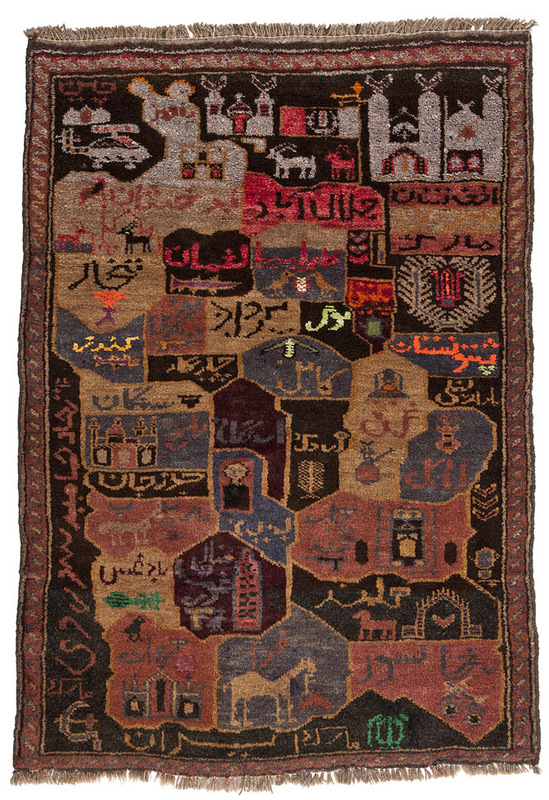 Such carpets as these can be attributed to the Aimak-speaking Hazara and Tajik people from the Ghor province, in the mid-western desert mountains of Afghanistan. P.P.S. See another related example here.